This is the list of the NHRA National events for 1976. In particular 1st and 2nd place in Pro Stock. So I have found that there were three of these press kits. They run from 1975 to 1977. I’ll put these together in a more unified way with the contents but..the images are fun so I thought I would upload them. 1973’s TOP PROFESSIONALS – Wayne Gapp, Don Garlits and Don Nicholson were the biggest winners of 1973 in the Professional ranks, with Ford Pro Stock driver Wayne Gapp (left) leading the way with wins at the World Finals and Supernationals, along with runner-up performances at the Gatornationals and U.S. Nationals. Garlits took the Winternationals and Supernationals, as well as finishing second at the Springnationals, while Nicholson utilized an early season hot streak to take the Winternationals and Gatornationals. 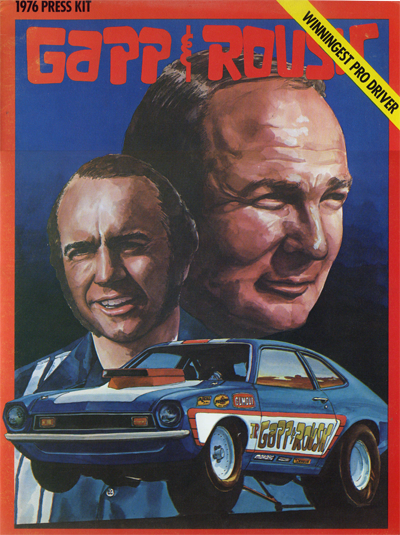 Ford Pro Stock campaigner Wayne Gapp, with 2 wins and 2 runner-up performances this past year, was 1973’s most successful racer in National Hot Rod Association Pro Stock competition. Right behind Gapp’s heels in the close ratings were Top Fuel driver Don Garlits, with 2 wins and 1 runner-up, and Don Nicholson, who had scored 2 victories and no runner-ups. The 1973 season, with no one professional racer able to produce more than 2 victories, compares contrastingly to the past two years in NHRA professional competition, which saw Ronnie Sox score 6 wins in 1971 and Bill Jenkins matching the feat in 1972. There were no double winners in Funny Car at all this year, and aside from Garlits’ 2 wins, the same stands for the Top Fuel ranks. For Gapp, the season started in frustration, losing the Gatornationals final round to Nicholson’s hole-shot, 9.040 to a 9.039, and then dropping the U.S. Nationals run-off to Bob Glidden by one-hundreth of a second, 9.08 to 9.09. He came on strong at the World Finals however, blasting Bill Jenkins’ 9.34 effort with a 9.17, and then got even with Glidden at the Supernationals, 8.87 to an 8.96. 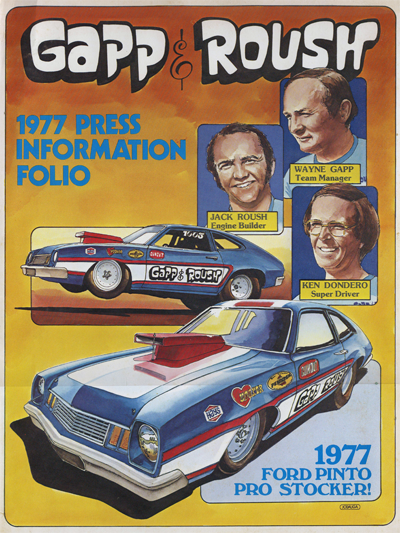 The 1976 Gapp & Roush press kit cover. Saw this article, which is pretty cool. I recently read the article posted on your site titled “THE TIJUANA TAXI: UNDER CONSTRUCTION”. First of all, thank you for posting the information. It is good to see Roush McClenaghan and Roush interested in creating a replica of the ‘Taxi’. I would like to make a few comments regarding the article. The author, David Exum, clearly referenced another article on your site by Brian Wood called “Hailing the Cab”. This should be acknowedged and linked to as it is a article that provides a great deal of background and is one of the few in-depth articles with Wayne Gapp that can be found. Here’s the Brian Wood article. The NHRA Drag Rules for 1974 and 1975 clearly and definitively allowed use of vehicles over 105 inches of wheelbase and allowed for significantly different weight factors for those vehicles that equaled or exceeded that wheelbase. The ‘Taxi’ was an effort to achieve maximum performance within the established rules…that is not a loophole…that’s just using the rules to maximize effect. The ‘Taxi’, as stated in the article, did not debut at the 1975 NHRA Winternationals. The first NHRA national event appearance of the ‘Taxi’ was at the 1974 Summernationals at Englishtown where a runner-up finish was scored against Larry Lombardo. The Taxi’s last run at a NHRA national event run for Gapp & Roush was on 12-October 1975 at Pomona where the car bowed out in the 2nd round of competition. The article states that the NHRA changed the rules for the ’75 season and these rule changes prompted the creation of the ‘Taxi’. This is not a correct statement. The rules that brought the ‘Taxi’ into existence were established by NHRA’s 1974 ‘NHRA Drag Rules’ and the 1975 ‘NHRA Drag Rules’ extended those rules but changed the weight factors in place. The ’74 rules provided a huge advantage in weight for vehicles whose wheelbase extended beyond 105 inches. There were disadvantages (weight transfer over the length of the vehicle for traction, placement of rear tires on the track area and aerodynamics) but the advantages were big enough to move in the direction of building these vehicles. Hence the rush to build the ‘Taxi’. What’s more impressive regarding the ‘Taxi’ is the performance of the vehicle during the 1975 season given the increase of the weight factor from 6.45/c.i. in 1974 to 7.10/c.i. in 1975. I did a little write-up of the effect of the rules here. 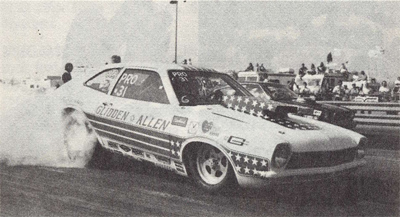 Lastly, most commentators have stated that NHRA removed a rule regarding the year of production for vehicles participating in Pro Stock and that this rule is the reason that Ford competitors (primarily Glidden and Nicholson) went to 1970 Mustangs bodies. NHRA may have intended to keep the rule at 5 years but from what I can tell they never _changed_ the rule to indicate that intention. Given that the 1970 Mustang is 108″ wheelbase vehicle and had two doors the reason for choosing that body style is due to the wheelbase rule and appearance rather than a change in the year of manufacture rule. Briefly stated, NHRA raised the weight break from 6.45 to 7.10 for the class of vehicle that ‘Taxi’ qualified as. The differences in these factors means that the ‘Taxi’ ran with 237.9 additional pounds in 1975 as compared to 1974. Yet, 3 NHRA national event wins and 3 runner-up finishes were notched in 1975 with another win at the 1974 GrandNational Molson event and a runner-up finish at the Summernationals in 1974. Good thing for the competition that NHRA raised the weight breaks otherwise the ‘Taxi’ would have been unbeatable in 1975 given the gains in performance. Time indeed was a factor in the construction of the vehicle. However, it was BECAUSE it would take only 60 days to build the ‘Taxi’ that the vehicle was constructed. Gapp & Roush were able to acquire the 2-door Maverick chassis and make few changes to the chassis, add the 4-door body from the A-pillar back and get to the track. Once again, thanks for the information about the ‘Taxi’! The Gapp & Roush race car known as the ‘Taxi’ was built to take advantage of the NHRA rules in effect. The story itself is a bit twisted both in actual history and in the re-telling over the years. Let’s see if I can lay out a straight line…so to speak. ENGINE, 100 lnch Wheelbase or More: Must be of 1965 or later manufacture and must be the same make as car. Any internal modifications permitted. Minimum total car weight, 2,400 lbs. Seems pretty straightforward. A legal NHRA small block car would weigh, assuming a engine displacement of 366 cubic inches, 2379 lbs. A big block car, say a Hemi, would have weighed around 2982 lbs. An extra 603 pounds was a killer for the big blocks. It becomes obvious why the small block cars were so successful during the 1973 season (in fact continuing their success from 1972). Going into 1974, needless to say, there were a few complaints. So NHRA tried again. Weight Minimums for the big block cars were lowered by 100 lbs. A car with 105″+ wheelbase has a significant advantage of .55 lbs. per cubic inch over the big block cars and .20 lbs. per cubic inch over the next classification. Ford didn’t make any recently manufactured two doors that were over 105″ that could be used. In fact, the 2-door Maverick was probably considered in the rules as the its wheelbase is 103″. The 4-door Maverick, however has a 109″ wheelbase. So a legal NHRA small block car over 105″ wheelbase would weigh, assuming a displacement of 366 cubic inches, 2360.7 lbs. A Pinto would weigh 2433.9. So, that is 73 lbs. MORE than the Maverick with the same engine. The weight advantage of small block (at 105+ inches of wheelbase) vs. big block has gone UP to 621.3 lbs. So..what happens? NHRA decides that the advantages provided for in the 1974 season need to adjusted. So they go insane adding complexity to the rules in the attempt to achieve parity. At this point, the rules are out of hand. I have included the relevant set of rules below. See here for all the engine rules. The Ford vehicles just got jacked…and the Pinto’s got hammered. Ford – 366 * 7.10 = 2598.6 lbs. Chevy – 366 * 6.90 = 2525.4 lbs. Chrylsler – 426 * 7.30 = 3109.8 lbs. In 1973 a small wheelbase Ford could run at: 2379 lbs. In 1974 a Ford long wheelbase car could run at: 2360.7 lbs. In 1974 a Ford small wheelbase car could run at: 2470.5 lbs. In 1975 a Ford long wheelbase car could run at: 2598.6 lbs. In 1975 a Ford small wheelbase car could run at: 2671.8 lbs. The difference between the 1974 weight and the 1975 weight was 237.9 lbs. In closing, the performance of the Taxi during 1975 is downright amazing given the attempts by NHRA to factor the vehicle. This is the list of the NHRA National events for 1973. In particular 1st and 2nd place in Pro Stock. 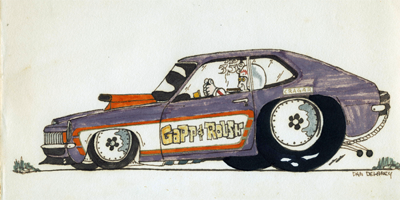 Illustration of 1976 Gapp & Roush Pinto – Dan Delancey? Something that I found in the files. Looks like Dan Delancy was the artist?